Coup is another portfolio theme by the team at Themes Kingdom. I’m a big fan of all of their other themes and Coup fits in well with their current selection of themes, keeping the design standard very high and being very modern and trendy. 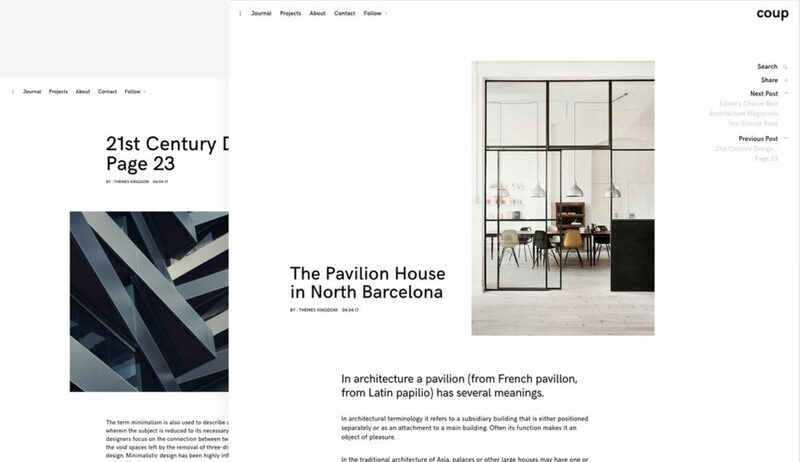 Coup is designed with architects in mind and it would work perfectly for a wide range of architect firms but it would also be suited to a wide range of agencies, or for simple freelancer portfolios. 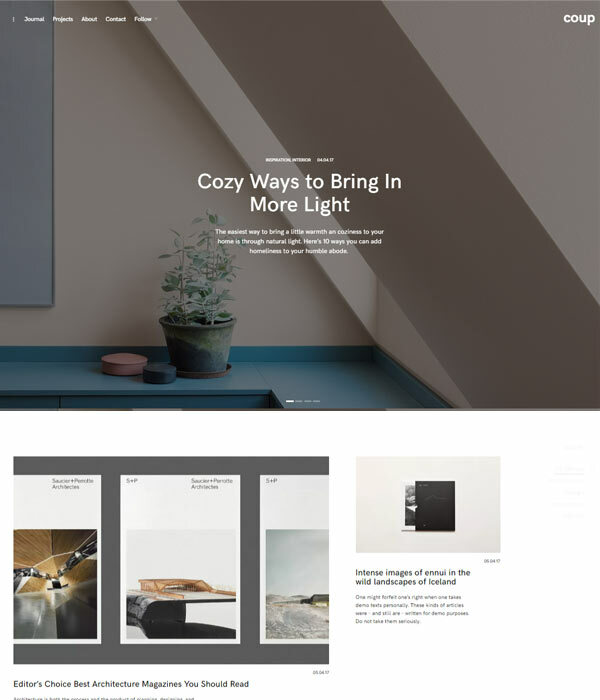 The current trend of asymmetry and broken grids are used very well in this theme. You can see right away on the homepage that the use of white space is unusual and does not conform to a traditional grid system. The ‘read more’ text visible when hovering on a project which overlaps the project item works well too. Unusual grid systems and asymmetry used well makes layouts more interesting and less boring but they are not to everyone tastes. Blog pages and portfolio pages are both as simple and minimal as you can get. Absolutely nothing other than the essentials is added and even as a lover of minimal designs, they do feel a little bit too bland for me. I’d like to see a little more going on here personally. The about us and contact pages are even more sparse and again, I’d like to see more going on here. They just seem too empty to me. Whilst I do have my reservations about some elements of the design, this theme would work very well for fans of minimalism. As with all Themes Kingdom themes, it is well made and easy to configure with key options being changeable via the customizer. You can change color options easily and change between different grid styles for the portfolio. One nice touch is the ability to detect whether featured images are in portrait or landscape and adjusting the layout accordingly. This means you can create some nice variety in your posts. The team behind the theme is top notch so if you think Coup would be a good fit for your website and you decide to buy, you’ll get great support. Overall, this is another great theme from Themes Kingdom but may not be too everyone’s tastes. Check out the demo now to see what you think. Like the Sound of this theme? Fast, friendly support and great customer service. Looks great on desktops, laptops, mobiles and tablets. Coded to high standards to help with speed and security. Well documented so that you can get up and running quickly.